The Isle of Wight Car Clubs 8th event and 3rd Sealed Surface event of 2018 was held at the Isle of Wight College. On the 2nd of September. From round 1 Ricky Sheppard was on form placing a time over 8 seconds faster than anyone else, even faster than the owner of the car he was driving, Steve Wells. However, by run 2 Steve had closed the gap to within a second. On this sunny September day, it looked like one of these gentlemen would be taking home the win and it was only a mater of time before we found out which one it would be. 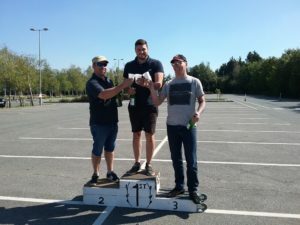 With no drivers in class 1 (unmodified under 1400cc) the battle in the non-modified cars title fell to the two MX5s in class 2 (unmodified under 1400cc). The father and son team of Barry and Kevin Richardson not only shared their car, they also sat beside each other as they went round in what is none as the PCA class, this allows drivers and passengers to better understand the course, give each other some coaching or guidance and it makes the event very sociable. If you would like to drive with a passenger, please ask for more information at your next event. Neither of these drivers could match the speed of Wayne Hole in his MX5, who not only won class 2 but also finished 8th overall. There was also a car share in class 3 (modified under 1400cc) with Dean Masterton and Gary Wetherick in their Suzuki Cappuccino, however, being in the modified class, they had totally stripped the car of any unnecessary interior, including the passenger seat so they were driving solo. David Goodwin was also competing in the same clas, but has recently made his car a little heavier now that he has started to remove some of the rust in his classic mini buy replaced the entire back panel. It was Gary Wetherick who was consistently faster in this group and deservedly collected fastest class 3 and finished 5th overall. Class 4 (modified over 1400cc) consisted Jo Moore and Jon Barrett in their AWD Subaru Impreza’s and Toby Allan in his Turbo Mx5. Despite having more power and four wheel drive the subarus could not match the agility of Toby in his MX5. Toby not only took the class win but finished 4th overall, missing out on the podium by 1.94 seconds. Steve Glass in his Honda Motorbike powered Fiat Cinquecento and Josh Finch in his MGF powered single seater special were both having teething problems with their cars in Class 5 cars (non production or heavily modified cars). But what looked like a guaranteed win for either Ricky or Steve was not to be as after a shaky start Chris Wilson leaped frogged them both in run 4, this run put him in the lead by 0.77 seconds for the rest of the day letting him stand on the top step of the podium. After a few wrong tests Steve managed to beat his fellow driver (always a relief when it is your car) and stood on the second step 1.61 seconds ahead of Ricky who claimed the 3rd step. In a break form from tradition, these three made a gentleman’s agreement not to shower each other with Champaign supplied by our podium sponsor Young Plumbing but to drink the bubbly from cups toasting each others success.